Metal bellows couplings made by sts, germany are the perfect choice in many areas where torsionally rigid and backlash-free shaft connections are required. Leveraging over the skills of our qualified team of professionals, we are instrumental in offering wide range of Bellow Coupling. DescriptionThe 5078 Ecoloc is made from stainless steel materials. Its hubs are designed from aluminium components. 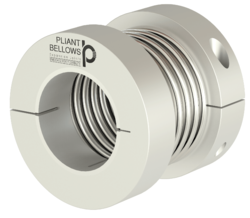 Also, the metal bellows coupling utilizes a compact design, and maximum misalignment compensation. The unit provides a backlash free capability, and shaft tolerance of g6 or h7. It is composed of precise transmission components, and oil-free contact surfaces.